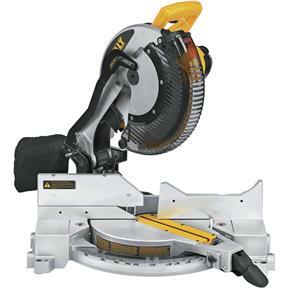 This DEWALT single-bevel compound miter saw's 12-inch blade is backed by a powerful and dependable 15 amp motor. Offering a no-load speed of 4,000 rpm, it makes quick work of cutting framing or molding, as well as other crosscutting and miter-cutting jobs. This sturdy saw is designed to deliver both a versatile setup and excellent accuracy to handle a variety of applications. The precise miter system's adjustable stainless steel miter detent plate features 11 positive stops for easy setup and improved productivity. An easy-to-adjust cam-lock miter handle delivers quick and accurate miter angles, as well as allowing for detent override--which allows you to adjust the miter setting without the saw slipping into the miter detents. The saw's wide miter capacity--0 to 50 degrees to the left and the right--adds versatility. In addition, a tall fence supports 5-1/4-inch crown molding nested vertically, as well as 6-1/2-inch base molding set vertically against the fence. This fence slides out of the way easily when it's time to make bevel cuts. This DEWALT saw is designed to deliver quick, accurate bevel cuts. Ideal for a range of applications, the saw can deliver clean, 45-degree bevel cuts through dimensional lumber that measures up to 2 by 8 inches. It also allows you to setup for bevel cuts that measure between 0 degrees and 48 degrees to the left and bevels that measure between 0 degrees and 3 degrees to the right, providing increased capacity for big jobs. Plus, with hardened steel bevel stops at 0, 33.9, 45 and 48 degrees, this saw delivers versatility and makes finding and setting the most common bevel angles a quick and easy process. Includes carbide blade, dust bag, and blade wrench.